Chickadee Gift Enclosures/Set of 9 by Pink Peppermint Paper, LLC. 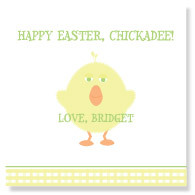 Description: This cute little chick is sure your make your little chickadee shine. Great for boys or girls.